Oceanside had a population of 167,000 people as of 2010, and it continues to grow. County Road S21 connects the city to neighboring Carlsbad, while Pacific Street runs along the coastline. Drivers should be paying attention to changing road conditions at all times, especially in the busy areas where I-5 intersects with Route 76 and Route 78. Unfortunately, many drivers operate their vehicles while distracted by something else. An inattentive driver is less likely to be able to respond to slowing traffic, a merging vehicle, falling debris, and other potential hazards. If you are injured in a car crash, you should consult an experienced Oceanside distracted driving accident lawyer at Rubinstein Law Group about whether there may be a basis to recover damages. If you have been injured in a distracted driving accident caused by someone else, you may be able to recover damages by proving negligence in civil court. 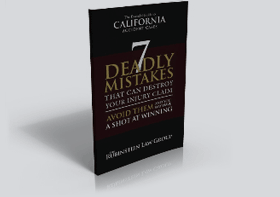 You will need to show that the defendant owed you a duty of care, the defendant breached this duty toward you, and actual and proximate causation connected the crash to your damages. Many people get drawn away from changing road conditions when they are texting while driving, eating, adjusting the radio or a GPS navigator, turning to look at pets or children, looking at the scenery, or applying makeup. In most cases, a jury will find that a driver's decision to pay attention to something other than the road is a breach of the duty that all drivers owe to use reasonable care. For example, if another driver was distracted by using his GPS and did not see you hit the brakes as a result of encountering heavy traffic on I-5, it is likely that the jury would find that he was negligent if this led to a rear-end collision. A distracted driving accident attorney also can help Oceanside residents determine their next steps if they were partly responsible for causing the accident in which they were injured. The defendant may argue that you were also negligent. California follows the rule of pure comparative negligence. The jury will consider the evidence and arguments, decide the total amount of damages, and assign percentages of fault. Your percentage of fault, if any, will be used to reduce the damages. For example, if the damages are $100,000, and you are found to be 30% at fault, while the defendant was 70% at fault, you can recover $70,000. Damages that you may be able to recover if liability is established include both economic and noneconomic losses. Economic losses are tangible losses, such as medical bills, lost income, out-of-pocket costs, property damage, rehabilitation, therapy, and replacement services. For most people, it is expensive to obtain the full range of treatment that becomes necessary after a serious car accident, particularly if catastrophic injuries like brain injuries or back injuries were sustained. Your Oceanside distracted driving accident attorney may also be able to recover noneconomic losses, such as pain and suffering, mental anguish, loss of enjoyment, and loss of consortium. An insurance adjuster for the at-fault party may contact you immediately after an accident, offering a small sum to cover a portion of the economic losses and hoping that you will take it and go away. However, the full range of the losses sustained can take months or a year to become known. Some injuries turn out to be far worse than they seemed immediately after an accident. It is important to consult an experienced attorney before talking to the at-fault party's insurance adjuster or signing anything. In some cases, it may be necessary to hire an economist or a medical expert to provide testimony about future wage loss, lost earning capacity, and future medical care that may be necessary. For example, it may be helpful to retain an expert on the issue of whether you will need revision surgery for visible scars resulting from a distracted driving accident. While distracted driving does not carry the same social stigma or criminal consequences as drunk driving, it can cause injuries that are just as painful, devastating, and costly to treat. You should contact an experienced personal injury attorney at Rubinstein Law Group if you have been involved in this type of crash. For a free consultation, call 866-771-7181 or contact us through our online form.